The game's title (Robot Roller-Derby Disco Dodgeball) covers 90% of what makes the game so great and entertaining. Robots with silly faces running on a single wheel, in a derby style arena, with amazing music, throwing dodgeballs at each other. This game does not attempt to lure you in with a story line, or AAA title graphics, but with solid gameplay that will have you playing match after match. If you manage to add a group of friends to the mix, I can only wish you luck tearing yourself from the game. The combination of the beating music and the quick paced dodgeball arena style gameplay lead to an incredibly entertaining experience that could have you playing for hours at a time. The lack of any real player base forces you to play against bots, unless you have friends to join you. While the single player experience is still fun, it is no match against a multiplayer match against real people. Truly a great game at its core. There was never a time where I was not having fun while playing. The UI is really easy to navigate, which makes creating and entering matches really easy. My favorite part of the game is the music in sync with the gameplay, which easily sinks the player into a fun dodgeball experience. However, with the lack of any player base it is difficult to find yourself playing for very long. So, if you can wrangle up a few friends this game is worth playing for hours, otherwise it is worth playing for a few matches against bots. The important thing though is that the game is worth playing regardless. The quick style dodgeball fun is what makes this game stand out. It does not matter if you are in a small arena with friends, or a large arena with random people, the purpose of the game revolves around hitting others while not getting hit. 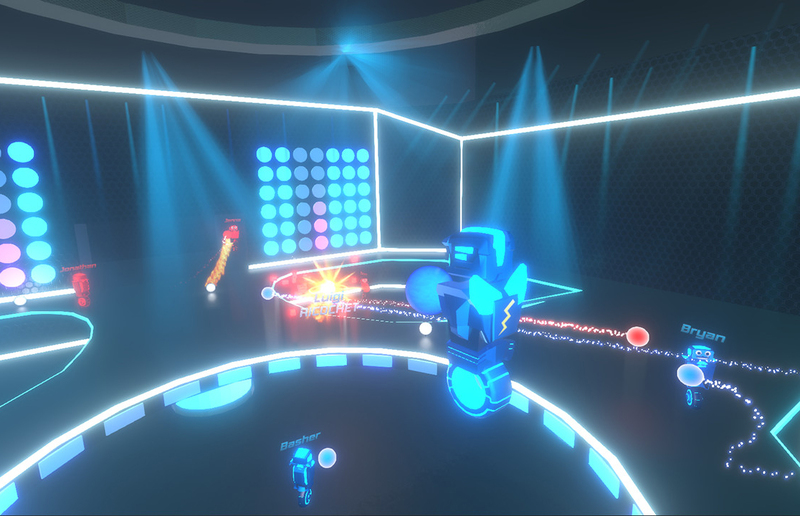 There are a few game modes that require some special play, such as throwing the dodgeball into a hoop, but even in that mode you are spending most of your time striking other players. One of the great things about the dodgeball theme is that it is always satisfying when you hit someone, especially if you catch their ball and get to watch them explode instead of you. While there is a lack of map diversity, it is easily made up by the core elements of the game where you can easily forget that you have played the same map twelve times now. The different game modes, such as point leader, are fun to play with. Being able to be the robot that everyone is chasing in attempts to stop you from getting any more take downs, is both exciting and terrifying. For the most part dodgeballs are readily available, but it always seems to be when you need one the most that they are all taken, and you are the only one without one. If you find yourself in that predicament, I would suggest you be ready to catch, otherwise you may be in pieces quite soon. The user interface (UI) is what allows the player to quickly get into the game without even thinking about it. This game's UI is very clean and straight to the point, it wants to put you into a game with minimal effort. The simple button style menu makes it almost impossible for the user to select an option by mistake or get lost in the menus, which it what makes it so great. While the game will not be winning awards for its graphics, the visuals of the game do stand out quite a bit. Immediately when entering a game red and blue patterns are laid out around the map, and you quickly need to establish which color you are. The robots look simple, yet have a great style about them that encourages you to hit them time after time. I don't know, maybe it is the smug look that they give you when you whip by them without a dodgeball, and then the cowardly look when finally throw a dodgeball in their direction. Hitting someone results in a grand explosion, which always put a smile to my face. It is easy to say someone is out and to reset them back to base, but the pure satisfaction of making someone explode in dodgeball is one of the most appealing parts of the game. When I launched the game for the first time I thought that my ear drums were going to switch instruments, because the music was so incredibly loud. With the setting set all the way to max, good luck trying to hear yourself thinking, so first thing that I had to do was turn the overall sound down a bit. Now that I was at a reasonable level of sound, the music was amazing. The music is really intense techno that does not stop playing. It is a very integral part of the game because it is one of the elements that allows the player to slip out of reality and emerge themselves into a robot eat robot world. The genre of music is all out specific beats and patterns, so it was always easy to find myself syncing up with the music when running and throwing. As far as I can tell there is no real matchmaker system implemented other than to place players into a lobby and let them go. Sadly, this is necessary evil because the player base currently does not really exist. Occasionally when I log on I will be one of the only people online, which makes it really difficult to find a server that is not just bots. Which when you think about it is weird, robot controlled robots, but that is a different article in itself. If you were to play this game I would highly recommend that you have your play at the same time, and everyone get into a voice chat program so that you all can yell at each other when you eventually blow one another to bits. Get it, bits? While multiplayer is the basis around the game, often times you will find yourself playing single player, which is just not the same experience.